Phua, deputy secretary (hub strategy), Ministry of Transport Singapore, Ms Quah Ley Hoon, chief executive, Maritime and Port Authority of Singapore and MTWG leaders at the 37th MTWG Opening Session. Image credit/MPA. A single shipping market and implementing the International Maritime Organisation's (IMO) 0.5% sulfur cap on bunker fuel top the agenda of the southeast Asian countries' association (ASEAN) working group meeting in Singapore. 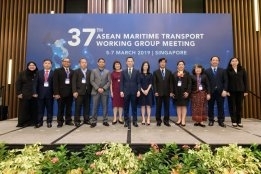 The 37th maritime transport working group meeting held in the regional bunkering and shipping hub this week will move the agenda forward under Singapore's chairmanship. The single shipping market "is expected to lead to the free flow of intra-ASEAN shipping services, where there will be no restriction to ASEAN shipping services, where there will be substantially no restriction to ASEAN shipping service suppliers in providing services and in establishing companies across national borders within the region, subject to domestic regulations", according to the Maritime and Port Authority of Singapore. The IMO sulfur cap comes into force from the start of next year. ASEAN is formed of ten regional states.